Take in the storied history of the Balinese islands with these elegant drops. 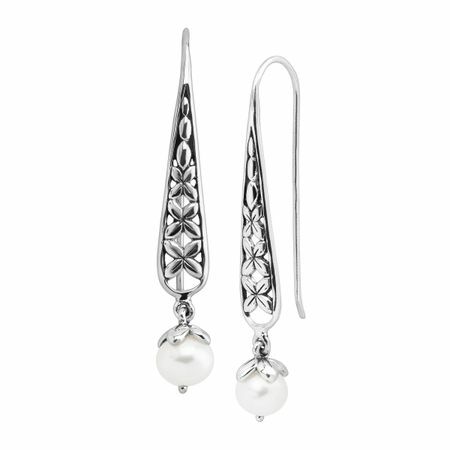 Freshwater pearls suspend at the base of these cut-out sterling silver drops, complete with elongated ear wires for a seamless look. This piece is part of our Balinese Collection, inspired by the beauty of Southeast Asia and handmade in Bali using ancient silversmith techniques. Earrings measure 1 1/2 by 1/4 inches and feature ear wire back findings. Pieces come with “.925” sterling silver stamps as symbols of guaranteed product quality.